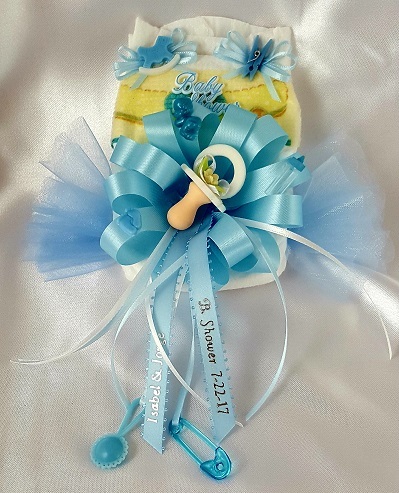 This unique diaper corsage will make the Mom-to-Be feel special. 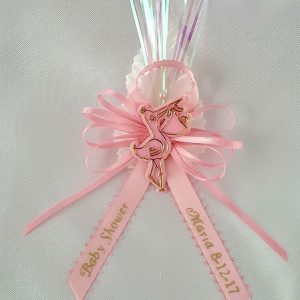 It comes personalized with her name and date of the Baby Shower at no additional cost. Whether it's for the Mon-to-Be, the Dad-to-Be, the proud grandparents, aunt and uncle, big brother or big sister, we have a special handmade corsage for every one in the family. All corsages are made to order. 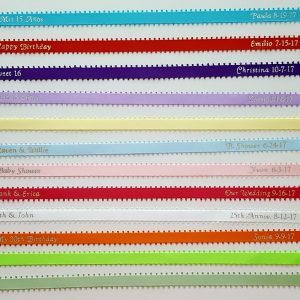 If you don't see the colors you want in the "Avl. Colors" drop down menu, choose the option "Other" and write the colors you need in the "Special Instructions" box. We will match and combine the colors to the best of our ability. Custom made items are subject to availability. We will contact you if any substitutions are needed. 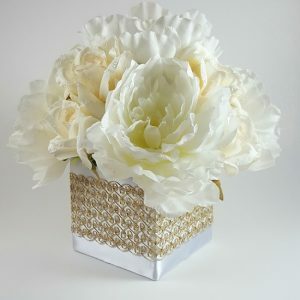 -This corsage measures approximately 9 1/2" from top to bottom and approximately 6 1/2" Wide. -Each corsage is handmade therefore no two are ever identical.